The L'application mobile Virtual Office allows you to make calls using direct dial, the contacts list, or the call log list. Once you are in a call, you have access to call management controls. How do I call via direct dial? Tap to open the main menu. From the main menu or from the Contacts screen, tap . Using the dialpad, enter the phone number you wish to dial. 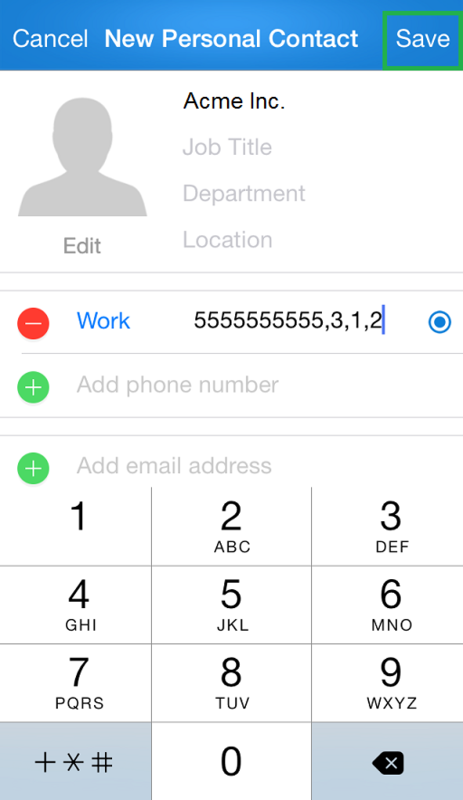 You can tap anywhere in the entered number to bring up a cursor to insert or delete numbers at that location. In this example, an 8x8 extension number is dialed. Note: The L'application mobile Virtual Office allows 8x8 extension-to-extension dialing from your device. If your company's phone system has Cross-Site Dialing enabled, extension users within the company can call or chat with one another, surpassing geographical barriers using global extension-to-extension dialing. This eliminates the need for complex extension dialing rules. You can simply tap a contact from the Contact de l'entreprise and call your coworkers in the same office, or in another city or country. Cross-Site Dialing is enabled for all employees of a company by the Gestionnaire de comptes administrator. Note: Cross-Site Dialing is only applicable to enterprise customers with multiple PBXs and branches. Tap Call to place the call. When the call connects, you have options to place the call on hold, transfer to another number, park a call, and record the call if you have Virtual Office Pro. You can also enhance the calling experience by starting a video session. How do I call via Contacts? From the main menu, select Contacts. From the navigation menu, tap . Favorites: Contacts you have marked as favorites. Company: Contacts from your Contact de l'entreprise. Device: Contacts imported from your device. Tap by the desired contact to place a call. How do I call via the Call Log? From the main menu, select Call Log. The call log displays inbound, outbound, and missed calls. Tap the desired phone number or contact, and the call is placed immediately. To end a call, tap End Call. How do I avoid navigating through long IVR menus and choices after calling a number? If you commonly call an organization such as a large office or pharmacy, you are familiar with that organization's IVR menu: "For sales, press 1. For billing inquiries, press 2. To return to the main menu, press *..."
You can save the organization number as a personal contact, and append your IVR choices to the saved number in order to save time. Note: You can also add pauses to calls without saving a new contact by holding down the * , key in the L'application mobile Virtual Office dialer. In Contacts, tap to start creating a new contact. In the New Personal Contact screen, enter the contact name, and tap to add a phone number to the contact. Enter the phone number, and tap the key to show more keys. 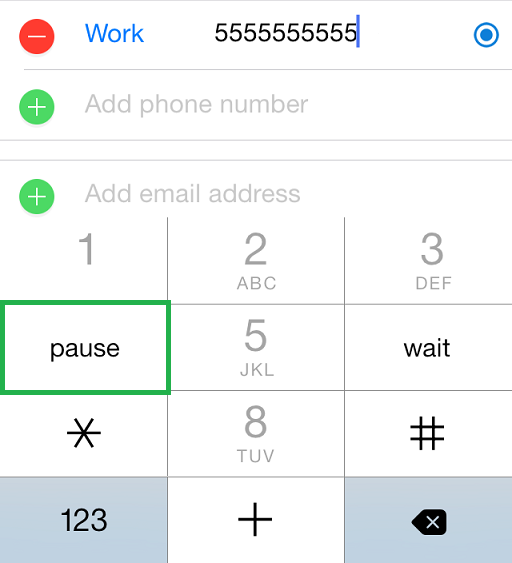 Tap the pause key to insert a pause for the IVR menu. You are taken back to the standard keypad. The pause you entered is indicated by a comma in the phone number. Insert your IVR menu choice numbers, each separated by a pause. The contact is saved with your IVR choices. Tap Answer to accept an incoming call. You are connected to the call. To reject a call, tap Decline. If you are logged in to the L'application mobile Virtual Office on your device but outside of the app, your device displays a notification to notify you of a new Virtual Office call. Note: By default, the option to unlock the device screen on an incoming call is enabled.